Last year, after driving a spectacular 40-mile scenic byway on that leg of our road-trip out west, Mugs and I found ourselves on an unexpected detour as the sun began to set. Apparently, a radical route revision for a restaurant we were headed to was so recent it had not yet made it to GPS. When we finally found a place to turnaround, we lingered a bit to watch as the sun set on the the spectacular Kolob Canyons. Where these unusual, almost crimson spires of Navaho Sandstone stretch along Ash Creek out of Zion National Park, I noticed a spot in our view where archeologists down from BYU had recently been busy excavating historic Fort Harmony. Having turned 24 years of age a couple of months earlier, it had briefly been the home of one of my maternal great-great grandfathers, Marion Jackson Shelton, in 1857 after journey by horseback up the Old Spanish Trail. 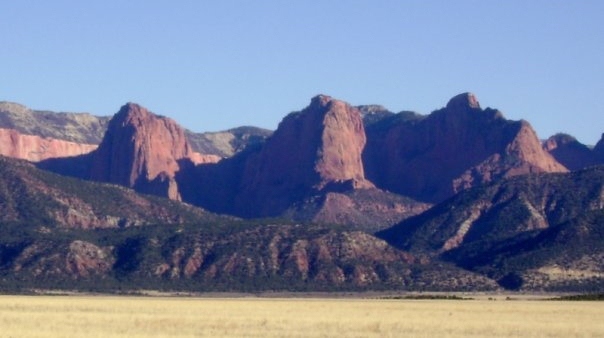 Through the Kolobs on horseback, the fort was a few hours from where the horrific Meadow Mountain Massacre had taken place a few weeks before Shelton’s arrival after a five day siege. Until his death two decades later from alcoholism, his brief stop along the trail at the site of the massacre would haunt him For a few weeks, he found himself teaching the children of the only man who would eventually be executed for the murders. Soon he was called 40 miles south back to Fort Clara and sent with other riders through the ancestral lands of Paiute, Hopi, Zuni and Navaho peoples in search for young children who may have survived the massacre. His journey there began 4,000 miles away in west-central Illinois where he was born the year after his father’s service in the Black Hawk War after migrating there from a place in Virginia only a hour’s ride from my home in North Carolina today. Marion Shelton’s mother died when he was two but during his early years he was given insight into Native American cultures by his grandmother’s story. Mary Neely Spears was a friend of Abraham Lincoln’s, who, as a young woman, had spent two years in captivity by a small band of Shawnee, a story that must have weighed heavily on my great-great grandfather’s mind as he rode in search of similar captives. In the 1840s he and his father joined a new, restorationist Christian religion, and when Marion was just 13, to escape religious persecution, they all fled for protection toward a part of the Rocky Mountains that was then a part of Mexico. By then, coupled with the traumatic experience of his grandmother and hearing stories from Mormons who had been threatened with cultural genocide in Missouri, and now Illinois, after the murder of Joseph Smith, teenage Marion Shelton already had a firm sense of how dangerous and unjust the world could be. But at the Missouri River his father joined the Mormon Battalion and with Marion and his new family, set off on what what would be the longest march in the annals of the U.S. infantry to fight in the War with Mexico. At Santa Fe, however, the Sheltons were sent north to Pueblo with a sick detachment. The next spring they set off north to follow the California-Mormon trail west, arriving a week after three of my other ancestors had arrived in Salt Lake Valley ahead of the vanguard wagon train of Mormons. The Sheltons wintered in Salt Lake and then migrated to a fort built prior to their arrival by “mountain man” Miles Goodyear, in what is today Ogden, Utah. But in 1849 they hit the trail again just as an effort percolated among “true believers” in the 18 year-old Mormon Church to purge it of non-conformists. Known now as the “Mormon Reformation” it included oratorical devices that, taken literally, may have culminated in the massacre less than a decade later. But the Sheltons may have just been drawn across Nevada, up and over the Sierras and down the Middle Fork of the American River to pan for gold by stories filtering back from fellow Battalion members there when it was first discovered. By 1852 the Sheltons had enough to buy squatter’s rights to a ranch lying a hundred miles further southwest near Stony Point in what had been a 66,000-acre land grant ranch between the Petaluma River and Sonoma Creek and surrendered by the 1848 ratification of the Treaty of Guadalupe Hidalgo. Judging by the diaries of Mormon missionaries who often dropped into visit, the Sheltons maintained connection, though lapsed, especially Marion who was in his early 20s. But two things changed his world in 1857. His father died shortly after Marion’s 24th birthday and word came that fall that all 40,000 Mormons should return to Utah to defend against an invasion of U.S. Army Dragoons. Church leaders were also contemplating a mass exodus to the Bitterroot Valley in the Pacific Northwest, a part of what is now western Montana a hundred miles over the Bitterroots from the Mormon Fort Lemhi in what is now Idaho. Marion Shelton turned over the ranch to a step-sibling, saddled up with a former Mormon Battalion officer and headed on horseback down California past Yerba Buena, what had once been a largely Mormon settlement recently renamed San Francisco, to Los Angeles. The small party grew as the trail flooded with returning Mormons at San Bernardino then up Old Spanish Trail past deserted Las Vegas Springs, another Mormon settlement into southern Utah, and past the recent killing ground where 120 people from Arkansas, Oklahoma and Missouri were murdered on the route to California. It will never be known what, if any, role was played by the paranoia of that time. It could have been fueled by the cumulative effects of twenty years of persecution or the murder that spring near the Arkansas-Oklahoma border of Mormon Apostle, Fort Harmony founder Parley P. Pratt, or a literal interpretation of a oratorical device used by true believers. In light of assassinations occurring today, we know the power that so-called oratorical devices have on people who take them literally, whether by radical clerics, or on talk radio, or by Tea Party partisans, or by leaders in hate groups. There is never an excuse for this type of violence, even in war time, regardless of Old Testament lore. And as evidenced by the memorial leaders encouraged the state to place at the site in 1990, Mormons today, some of whom who are descendants of those murdered, still mourn what happened at Meadow Mountain just as my great-grandfather must have done for the remainder of his life. I sense his broken heart in the affidavits given to judges to things he heard subsequent to the massacre, precious because they give me a glimpse of his handwriting and the education he had gleaned during his witness of events during his ten year journey through history to that time. He spent the next decade or more living with and teaching Hopi and Zuni people in their pueblos on the plateau of northeastern Arizona. He worked hard, but in vain, to develop an alphabet for them. He became fluent in Spanish as well as Hopílavayi and the Ute-Chemehuevi of the Southern Paiute people, just as two of my other great-great grandfathers did in the languages of the Shoshone and Bannock much further north. But the trails he blazed back and forth also in time became roads for settlers. He eventually sought peace in the lush river bottomlands of plateaus further north in Castle Valley where my great-grandmother was born before Shelton died just six years later in Heber City, Utah, just as the Second Industrial Revolution began to take shape. Marion Shelton was buried in Provo where I attended BYU, eight decades after his death, and where I first learned of and then visited Meadow Mountain on a cool haunting morning after spending a night with friends in the Kolobs in the late 1960s. I hadn’t planned to return to Fort Harmony during last year’s road-trip, but I’m glad I did, if only to be reminded of Marion Shelton’s part of my heritage and to recall the remarkable history, places and events that shaped his life.